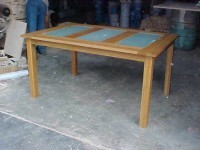 Furniture can be specifically designed and manufactured to your specifications. With the help of our team based on site in Asia we can source the exact product you require, made out of the materials you want, in the colour and design you want. This can then be an exclusive range just for you. It is also important that we place the production into the right factory. Some larger factories require large minimum production runs for developing exclusive items, so this would prevent the smaller buyer from proceeding. Therefore, it helps if we know what sort of volumes you are looking for. All we need from you is the design, then leave the rest to us. Contact us for more details.